It is fairly common to hear people saying that tablets and digital paper are the same things, and tablets are even better since it is colorful with backlight. Is that true? Not so! General tablets have a liquid crystal display that emits blue light which causes serious eyestrain. 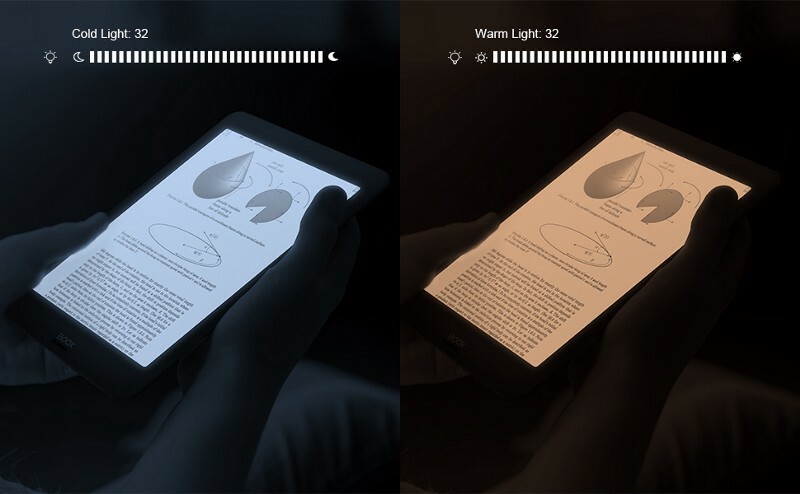 In contrast, the E-ink and e-paper technology relies on the light reflecting, not emitting. In this way, the text on it looks more natural and comfortable even reading for a long time. At the end of Feb. 2019, the Boox Nova Pro was rolled out on Boox official online shop as well as US Amazon. Once you take this device in hand, you get to know what are the fundamental differences between tablets and eReaders. The Nova Pro features a 7.8” E-Ink Carta HD screen with a resolution of 1872×1404 and 300PPI. The screen is completely flush with the bezel. Underneath the hood is a 1.6GHZ quad-core processor. There is 32GB of storage, 2GB of RAM, USB-C, 2800 mAh battery and Android 6.0. Different from the past series, the 7.8” Nova series have frontlights. So, what are the differences between frontlights and backlights? For producing crisp, clear colors on LCD screens, backlights are often used on tablets and mobile phones. They are set on the base of the screens that directly shine out toward your eyes. Therefore, it is easy to get eyestrain and fatigue with backlight when reading for long hours. As for the frontlights, they are located along the side of an E-ink screen, on the one side of edge, with light to another side, forming a light layer over the top to help evenly diffuse the lighting across the screen. In another word, the larger is the screen size, the more difficult to utilize frontlights on it, since lighting may not strong enough to be even in a large area. 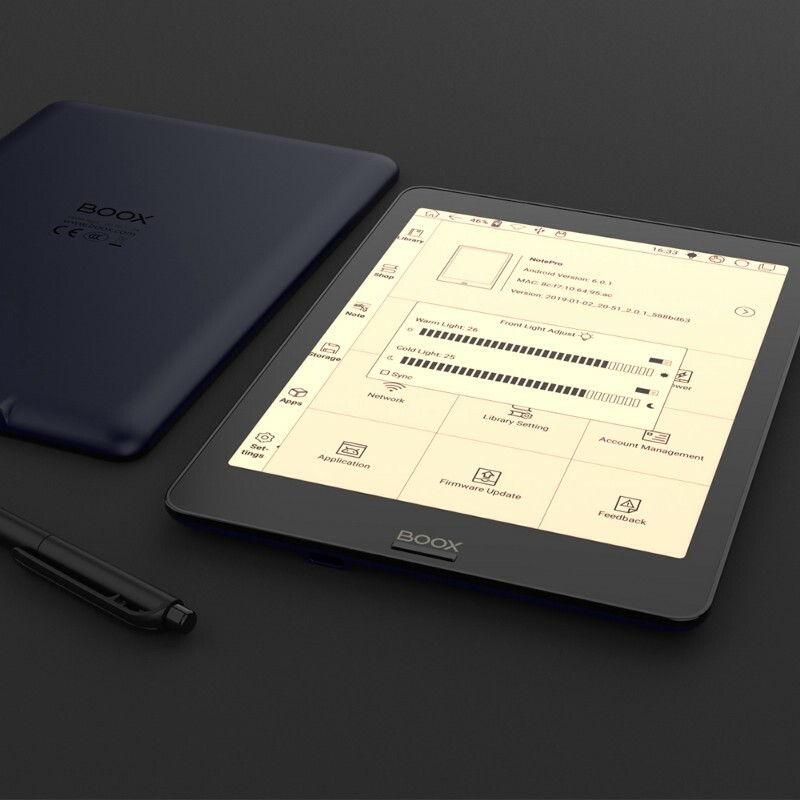 The Boox Nova Pro features a 7.8-inch E-ink screen with frontlights. The advantage of the fontlight is to keep your away from being exposed to blue light continuously. The light is projected to screen first and then refects to your eyes, which is more gentle than the backlights, and it is really helpful to minimize the eyestrain and harm on eyes. Have you ever experienced to get pains on eyes when you read your cell phone in a dark environment? Your eyes may be tired out more quickly if you read with a cold light. The Nova Pro also has an adjustable temperature color system. The front light can be adjusted to warm or cold light at different levels until users feel ease on eyes depending on situations. So how to choose a cold or warm light for reading? Actually, there is no such specific way to identify when or where to use cold light or warm light. The choice is about personal preference and use. The warm light is capable of providing a traditional warm, cozy feeling whereas the cold light gives a whiter, more energetic feeling. The warm light is highly recommended to use because it feels more natural and easy indoors when doing a reading. And, cold light feels sharper and help us to see clearly but it contains more blue light at the same time. Apart from the front lights, the Nova Pro also supports capacitive touch and digitizer touch, which mean you are allowed to manage the device by fingers and stylus easily. It is not just an eReader, but a digital note-taking device. Note taking is one of the most important parts of everyone’s life starting from business people, journalists, and college students. But gone are the days while people used to take out their pen and papers to take notes. 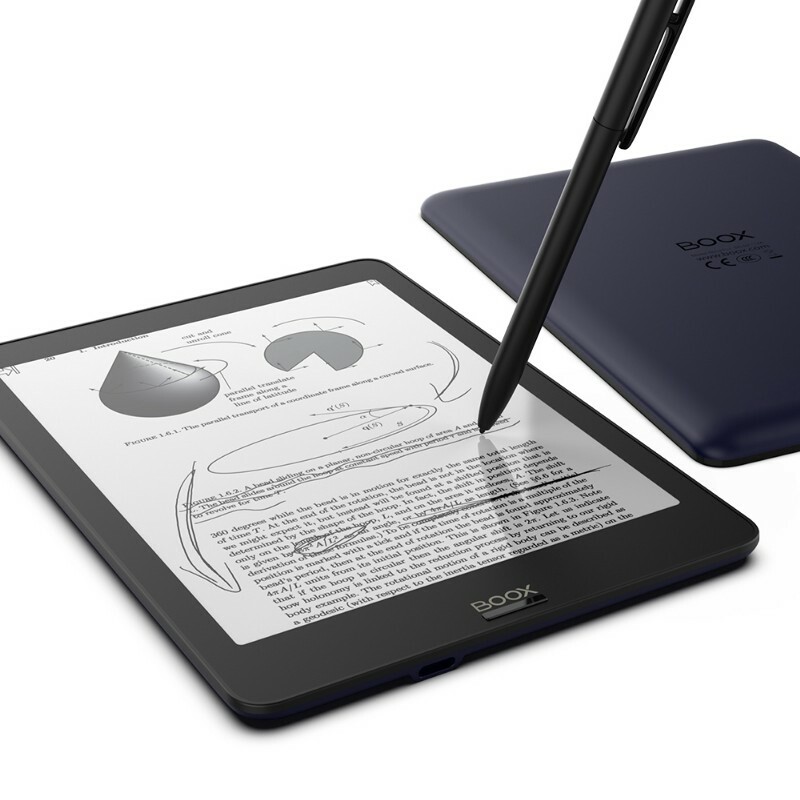 The 7.8” Boox Nova is the most convenient device to take notes as it just requires switching on it and start taking notes easily which can be again edited or modified with the accompanied stylus as per your requirement. In the end, the Boox Nova Pro is pretty an outstanding eReader if you want to read in the dark and day. Its size makes it be suitable for taking outside to read and take notes anytime and anywhere. However, the ideal reading situation is to be under natural light or have sufficient lighting for reading. Users have better not read in a dim environment that may damage eyesight.